The question: What football rule was cited in a controversial decision by a referee in Grossmont’s second home game that stopped a Grossmont comeback and preserved El Camino’s tough-fought 21-14 victory? It had come down to this: with less than two minutes remaining, the Grossmont Griffins had just scored a touchdown to cut El Camino’s lead in half. The teams lined up for the ensuing kickoff that just about everyone expected would be an onside kick. Uh-oh, wait a minute. 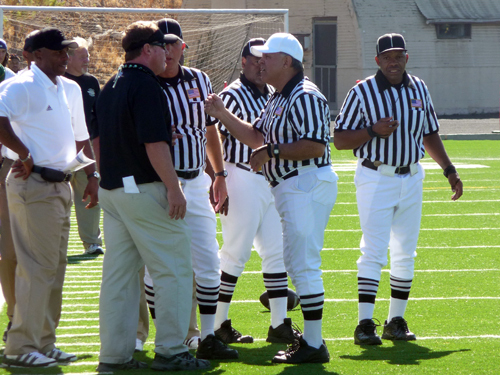 Referees were conferring on the field. One by one they joined, until they all were I the huddle, surrounded by Grossmont players, El Camino players, Coach Mike Jordan. While the refs are talking-and talking-let’s recap the game thus far. Grossmont scored first, taking the lead on a one-yard run by running back Derrin Alix. The touchdown drive was set up when linebacker Pat Kelly intercepted a pass by El Camino quarterback Dex Lucci. Things were looking pretty good for the home team for most of the first half. The Grossmont offense was making plays and first downs, mostly through the passing game. The defense was containing El Camino, especially on third-down conversions. However, the Griffins were unable to score again as the game proceeded. Some promising drives were cut short by turnovers. Some were slowed by penalties. Some faltered on plays in which quarterback Ryan Woods was sacked or pressured. Two drives ended with missed field goal kicks by Derby (one miss had been partially blocked). GROSSMONT COLLEGE — For football head coach Mike Jordan, Grossmont’s 36-7 thumping of the San Diego Mesa College Olympians Saturday afternoon, Sept. 4, was a “pretty good, pretty sound ” team performance. For the 800 or so fans at Mashin-Roth Field who braved the intense September sun and heat, the Griffins’ home opener was an entertaining, if not terribly suspenseful, triumph. The Griffins scored a touchdown on their first drive and never looked back. They made big plays on offense, defense, and special teams, and held Mesa scoreless until the game’s final minute. For starting quarterback Ryan Woods, however, the game meant something more — the end of a four-year detour. The last time the Grossmont sophomore had started a game was in 2006 for Granite Hills High School. The next season he attended Fresno State but was “gray-shirted” and did not play a down. Finally last season Woods made the Grossmont football team, but as a substitute quarterback whose playing was limited to holding the ball for placekickers. Whatever jitters Wood may have had were probably helped by Grossmont’s first drive. Woods completed several key passes for first down, including one in which he got drilled right after releasing the ball. The Griffins marched down the field and scored when RB Darrin Alix (Patrick Henry) took a direct snap and bulled into the endzone from two yards out. By halftime the score was 16-0. Grossmont had amassed 211 total yards, while holding Mesa to 31. Woods finished the game with 22 of 33 passes completed for 238 yards, including touchdown passes to Alex McLeland (Scripps Ranch) and Jedon Matthews (Horizon). Many of the passes were quick slants and screens, as Woods took advantage of Mesa’s pass coverage scheme that left the underneath routes open. “Just taking what the defense was giving us,” he stated after the game. The Griffin defense gave very little to Mesa’s offense, holding them to 58 total yards and zero points. The Olympians scored their one touchdown when DB Emilio Diaz (Point Loma) picked up a fumble by substitute quarterback Nick Carey (Tesoro) and ran 76 yards for the score with 19 seconds remaining in the game. An argument could be made that the score could and should have been 52-0 if not for some Grossmont mistakes. This marked the thirteenth straight victory for the Griffins over the Olympians. Grossmont faces a much tougher test at its next game on Saturday, September 11, against El Camino. Game time is 1 pm. 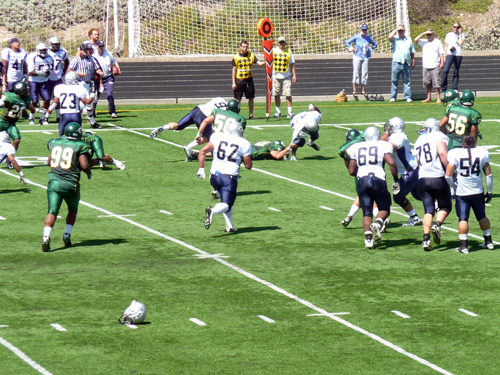 The weather was sunny, breezy, and hot for Grossmont’s 2010 football opener in which the Griffins easily beat Mesa College. 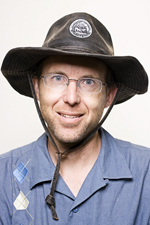 Temperatures topped 100 degrees. Athletic director Jim Spillers proclaimed a 150 degree “field temperature” to account for both the weather and the way Grossmont’s artificial turf stored and reflected solar heat. The heat seemed to have more impact off the football field than on it. A nine-year old girl was taken to Grossmont Hospital by the El Cajon Fire Department; the initial diagnosis was heat exhaustion. One of the referees did not come out for the second half due to heat-related issues; the remaining crew of six worked the rest of the game. The concession stand ran out of Gatorade by halftime. The Mesa sideline ran out of ice in the fourth quarter (Grossmont’s busy water team dispatched some of their supply). Many large umbrellas were deployed on the bleachers for shade. A good number of fans without umbrellas declined to sit in the bleachers at all and instead gathered in a corner of the field on the cinder track — because that is where the shade was. Team mascot Gizmo was nowhere to be seen, presumably because of the heat wave. Run of the game: A tie between Tucker Spruill (Grassfield, Chesapeake, VA) with his fifty-yard burst in the fourth quarter, and Tramaine Wilkes (Charles Hebert, Springdale, MD), with his runback after an interception. Hit of the game: Connor Derby (Casa Grande), the kicker, inflicted serious punishment on Mesa’s kickoff returner one time (hmmm, not something you see quite often in the NFL). Oh, and Derby also kicked three field goals and three extra points). Football rule I did not know until this game: If the wind blows the football of the tee just before the kicker’s foot reaches it, you get a do-over. Derby took advantage of the second chance to place a successful onside kick. Question I was hesitant to to ask following the game while on the field surrounded by football players: Um, was that onside kick intentional? Dudley is a student in Media Communications 132, the class which produces both the online GC Summit and the printed Summit newspaper.